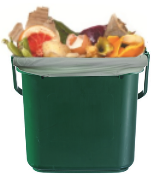 Perth & Kinross Council is working with Biobag Scotland Limited to supply residents with compostable caddy liners to make it easier for you to recycle your food waste. Supplied in rolls of 26 bags and guaranteed to fit your Council issued kitchen food waste caddy. As a guide, most households use 156 bags per year (6 rolls). Prices include Royal Mail delivery within 2-3 working days. Click here to view / download the council's food waste service leaflet. Looking for more than just a few rolls of bags? We are able to supply cartons of caddy liners for your local community group, school, organisation or trade at reduced prices. Each carton contains 1950 liners (75 rolls of 26). Prices include VAT and delivery within 3-5 working days. Select the number of bags required below, click the ‘Add to cart’ button and then go to the checkout to complete your order. Payment can be made secureley online by debit / credit card or PayPal. Please select the number of cartons required below.